The Professional Outdoor Media Association, Inc. is a group of individual communicators and Corporate Partners who believe in, defend, support and promote the heritage of hunting, fishing, shooting, and traditional outdoor sports through writing, photography, and other means. By doing so, members hope to educate the general public about these sports and encourage more participation in them. The organization serves the membership by helping members grow professionally, improve their skills, better their working environments and enhance their business. In order to meet the specific needs of traditional outdoor communicators, POMA was in need of a website redesign with a user-friendly layout for both members and the general public. They wanted a modern design that could be updated on a daily basis to keep members informed. POMA also wanted an innovative way to deliver detailed information about outdoor sports like hunting, fishing, and trapping. We strategized ways to make POMA’s website more informative and effective, and considered various integration tools to reach as many individuals as possible. 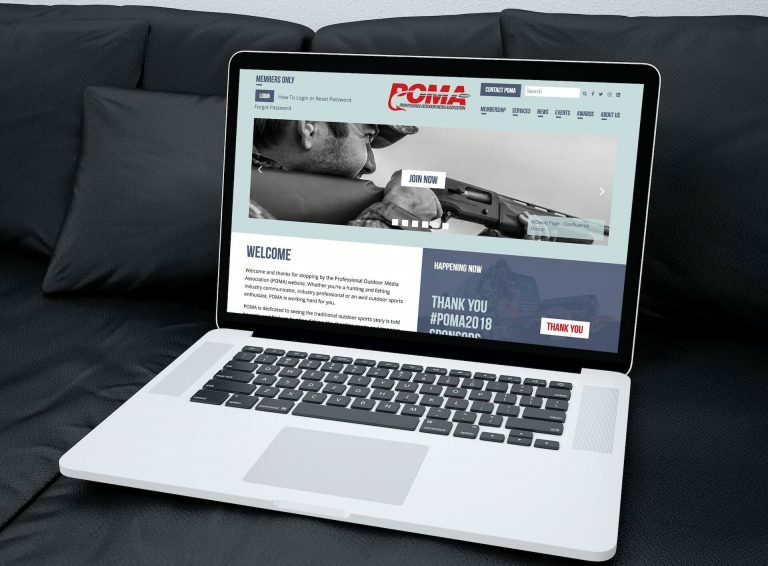 POMA wanted a website host that was easy to update and maintain, with various capabilities for members to connect with one another and find out more about traditional outdoor sports. Most importantly, we wanted the website’s back-end to be simple and manageable for POMA’s administrators. We also created separate sitemaps with separate content for POMA members and the general public, and implemented various tools that enable users to connect. We created a platform for members to offer business discounts, post for jobs and internships, and various other opportunities. We integrated social media and Wild Apricot, a Customer Relationship Management (CRM) software used by organizations to help manage membership, website, events, and other activities. Daily & Weekly automatic e-newsletters were also implemented using website posts as content. We created a website for POMA that has a modern aesthetic, convenient maintenance options, and a great deal of valuable content. We gave users the option to subscribe and keep up with POMA news, events and issues in a structured, sensible layout. We provided specialized content and features for POMA members, integrated various options for social sharing and searching. E-newsletters are distributed automatically daily and weekly with content from the website. Emails are distributed automatically without POMA initiating each update. Professionaloutdoormedia.org is user friendly for members, public visitors and site administrators.